Car Wash Concierge automatically tracks every car going through your wash with no human interaction needed, providing equity mining opportunities for sales and retention mining for service. Car Wash Concierge automatically identifies vehicles in your car wash using License Plate Recognition (LPR) technology. With a car’s VIN, we then integrate with your DMS and a number of sales analytics partners to provide valuable information at your fingertips that you can use to connect with the customer and even make a sale. 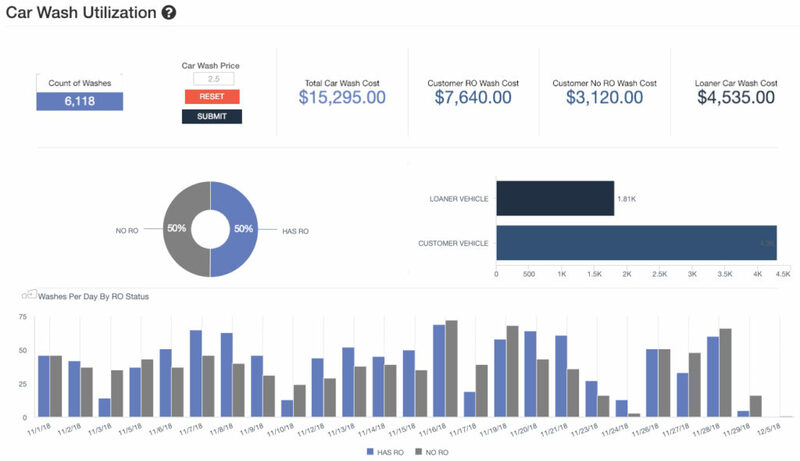 We also provide detailed wash analytics to help your car wash run more efficiently. How can my car wash make me money? Are there any privacy concerns with using Car Wash Concierge? Our technology works through integration with your dealership management system (DMS), and your customer information is visible only to your employees. Therefore, there are no privacy issues when using Car Wash Concierge. What Dealership Management Systems (DMS) does Car Wash Concierge integrate with? Car Wash Concierge integrates and is certified with all major DMS providers: CDK, Reynolds & Reynolds, and DealerTrack. This means we can provide real-time access to guest information, right at your fingertips. We also integrate with many of the industry leaders in Sales Analytics, CRM, Loaner Management, and Service Tablets. Please visit our Integrations page for a full list of our integration partners.